You are on the latest version of your Meeting Owl App. If your app is on version 1.9.0 or below, and your Meeting Owl software is up to date, your Owl will not appear in this list. There is nobody else connected to your Meeting Owl. Only one person can connect to the Meeting Owl at a time. Your mobile device has Bluetooth®️ turned on. When prompted by the app, go to Settings > Bluetooth > On. If Bluetooth®️ is turned on, go to Settings > Bluetooth to turn Bluetooth®️ off for 10 seconds, then turn Bluetooth®️ back on. Force quit the Meeting Owl app on your mobile device, then reopen the app. Reboot the Meeting Owl by unplugging your Owl’s power for 10 seconds and plugging it back in. Wait until your Owl's eyes stop pulsing and you hear a hoot. If your Owl's eyes do not pulse, contact Owl Labs support. 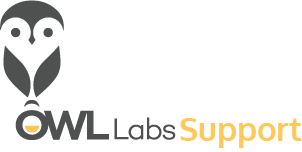 If problem persists, contact Owl Labs support.